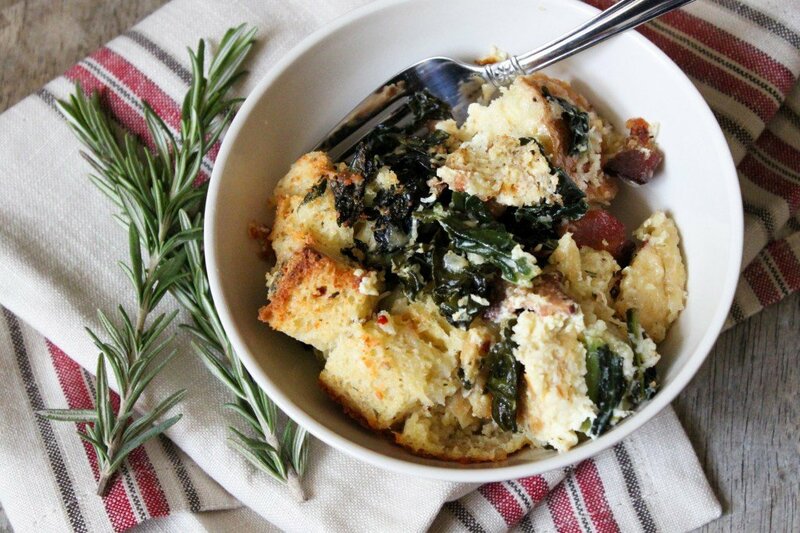 This savory parmesan bread pudding is perfect for lazy weekends and Sunday brunches. Mix in your favorite veggies, herbs, and seasonings to customize to your liking. I don’t enjoy cooking dinner. For the most part, I think its too time consuming. All I want to do in the evening is plop on the couch and either watch TV or read a good book. Dinner is the boyfriend’s job, and he’s quite good at it. I prefer to be responsible for breakfast. 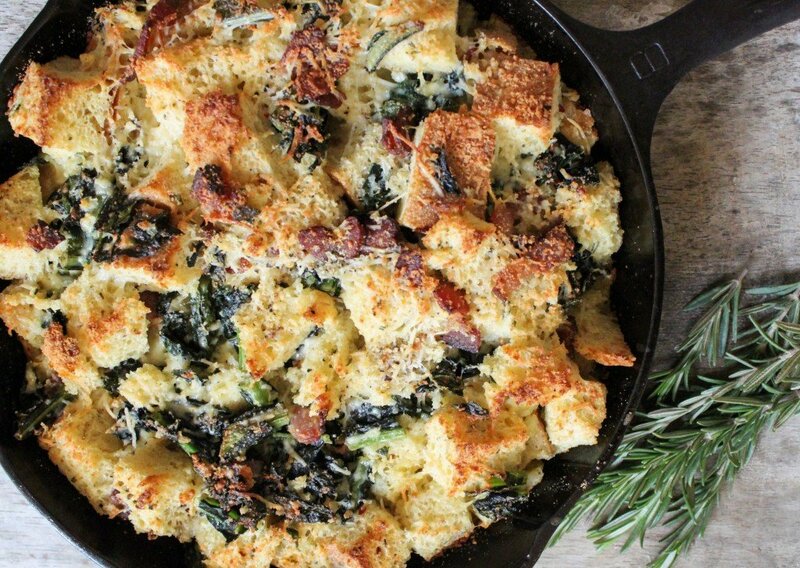 This savory parmesan bread pudding is perfect for lazy weekends and Sunday brunches. Its a great way to use up excess items you may have in your kitchen and pantry. Not only is it easy to customize, it requires little prep and is quick to make. I have learned that the smell of bacon is the simplest way to wake people up. Have you ever tried to wake someone that doesn’t want to be woken at 7am on a Saturday morning? Let me tell you, it is tough stuff. Sometimes, no amount of noise, light or force can disturb sleeping logs. If you happen to have a party the night before and you end up with a couple of overnight guests, bacon is surely the quickest way to get them awake, functioning, and off of the living room couch. I live in a tri-level loft and my kitchen is on the second floor. No matter where you are in the house, you can definitely smell what I’m whipping up in the kitchen. I’m all about sharing food. I don’t mind eating alone, but its always more enjoyable with good company and conversation. The boyfriend claims everything I make is delicious (I don’t know whether this opinion stems from his fear of me or whether my cooking is actually good), so I welcome getting feedback from other people. This savory bread pudding serves up a good portion. While the boyfriend and I can easily eat this all by ourselves, I think its better shared with others. I used up leftover rosemary bread; you can use whatever crusty bread you happen to have around. I’m sure everyone has bacon in the fridge. If you don’t have kale, use spinach or broccoli. Like I said, its easy and customizable. 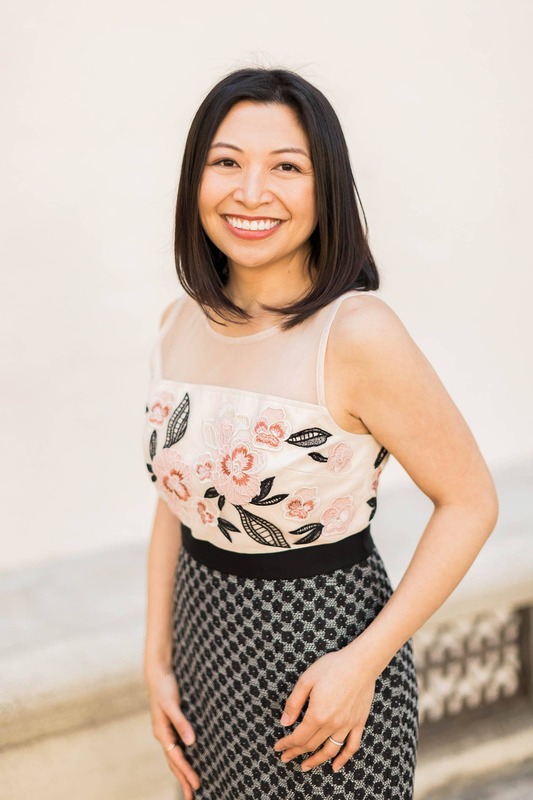 You can tweak it to the likings of your guests. Its a one pot meal. You get your eggs, toast, bacon and some veggies all in one plate. What else can you for ask to start your day? Swirl olive oil in 10-inch cast iron skillet to coat the pan. Heat oil over medium heat. Add bacon and let cook until bacon fat has rendered. Add in chopped kale. Season with a little salt and pepper. Cook, tossing, until kale is tender and slightly wilted. Taste kale to make sure it is cooked. In a large bowl, whisk together red pepper flakes, eggs, milk, about 2 tsp salt, and 1 tsp fresh ground black pepper. 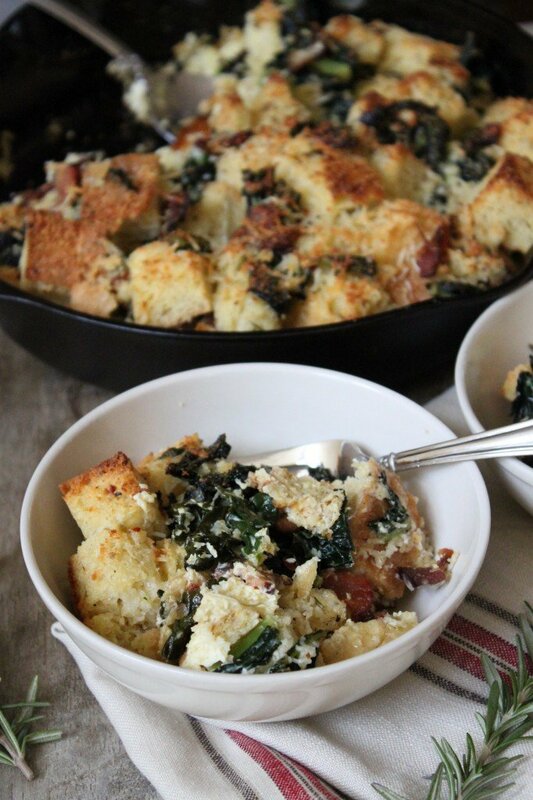 Add cooked kale and bacon, bread cubes, 1/2 cup parmesan, 1/4 cup fontina and 1 tsp fresh rosemary. Toss to combine and ensure bread is coated with egg mixture. Transfer to 10-inch skillet used to cook bacon and kale. Distribute to make an even layer. Sprinkle top with remaining 2 Tbsp parmesan. Bake for 30-40 minutes until bread pudding has puffed up, top layer of bread is toasty, and pudding is set in the center. Serve warm with additional parmesan cheese. Oh wow that looks amazing. I’m looking forward to making that soon. This is a brilliant idea for breakfast, I think would be a great sub for home fries for brunch! I totally agree! Dainty girls need bacon once in a while.